i’m fan of chicken strips. i like that you can eat them with a variety of dips and they always taste good. i also like that you can get them at just about any restaurant. chicken strips are always a safety net for me. 🙂 anyways, i’ve struggled with finding a really good chicken strip recipe that you can make at home, you know, sans the deep fryer, messy batter and extra fat and calories. i think i’ve finally found it! in a small bowl, whisk together eggs and buttermilk. in a larger bowl, mix together bread crumbs, parmesan cheese, ranch dressing mix, salt and pepper. dip each tenderloin into the buttermilk/egg mixture and then place into bread crumb bowl. cover each tenderloin well. 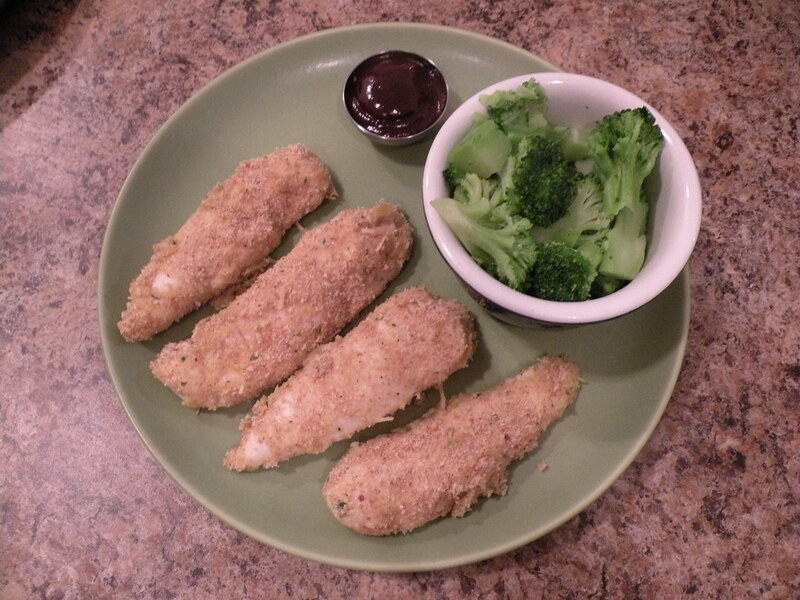 place tenderloins in a single layer on a greased 9×13″ baking dish. bake in oven for 15 or until golden brown. try dipping them in bbq, ranch or honey mustard!